"Sporting character is evident in all Jaguar sedans. In the XFR-S that character has been amplified, the result being a truly engaging car with a combination of technical innovation, assertive design and staggering performance that will satisfy the most demanding of drivers." Los Angeles, CA - November 28, 2012: The second model in the Jaguar ultra-high performance R-S range, the XFR-S Sedan joins its XKR-S sibling as a vivid expression of the carmaker's longstanding performance lineage. Just 100 of these ultra-performance sedans will be offered for the U.S. market, making it one of the most exclusive Jaguar models. The 5-liter supercharged V8 engine provides electrifying performance from 550hp and 502 lb-ft of torque - up 40hp and 41 lb-ft, respectively, over the XFR. The increases have been achieved through revisions to the engine management system and improvements to the intake and exhaust flow. This all-new combination provides a visceral blend of vivid acceleration and driver involvement. The 2014 Jaguar XFR-S can accelerate from zero to 60 mph in 4.4 seconds1 (0-100 km/h in 4.6 seconds) and reach an electronically-limited maximum track speed of 186 mph1 (300km/h). The all-aluminum 32-valve quad-cam engine delivers not only extraordinary performance but also efficiency thanks to such technologies as spray-guided direct injection (SGDI) and dual independent variable cam timing (DIVCT). The high-pressure die-cast lightweight aluminum block is stiffened with cast iron liners and cross-bolted main bearing caps, providing refinement to match its power. Between the aluminum four-valve cylinder heads sits a Roots-type twin vortex supercharger fed by two intercoolers to reduce the temperature of the pressurized air to optimize power and efficiency. Each intercooler features its own water-cooling circuit. The XFR-S exhaust system replaces the central muffler with an X-piece and near straight-through rear pipes. The combination yields an enhanced exhaust note that "crackles" on deceleration. The intake system also features a symposer that channels some induction sounds into the cabin, adding to the auditory excitement of driving the XFR-S.
A number of key driveline components have been uprated in order to both adapt the XFR-S for the greater power and torque outputs and stiffen the entire drivetrain to make its responses more immediate. These include uprated half-shafts, a larger central bearing on the driveshaft, and a new torque converter. These changes have allowed Jaguar engineers to tune the throttle response to suit the more focused nature of the XFR-S. The response to throttle inputs has been made significantly quicker. Engaging Dynamic Mode increases engine response for a given movement of the accelerator pedal. The eight-speed automatic transmission with Quickshift technology maximizes the benefit of the engine recalibration. 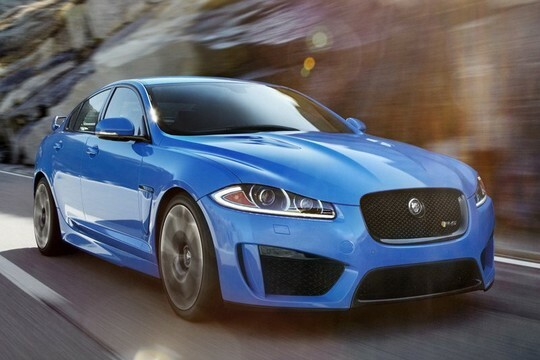 Quickshift ideally suits the XFR-S model's track-tuned performance capability. When the driver shifts manually by using the steering wheel-mounted paddles, the Quickshift strategy ensures the quickest, crispest shifts via rapid and precisely timed engine torque intervention. When downshifting (either manually or when in Sport mode), the engine management system automatically blips the throttle to ensure the XFR-S remains balanced, particularly important when entering a corner. This function also allows the transmission to perform multiple and very rapid downshifts during hard braking. When operating in automatic mode, the transmission can detect the manner in which the car is being driven by monitoring acceleration and braking, cornering forces, throttle and brake pedal activity, road load and kickdown request. On detecting a more enthusiastic driving style, the transmission will automatically make the gearshifts more aggressive and move the upshift point higher in the rev range. Corner Recognition senses when the car is negotiating a bend, the transmission holding the correct gear for the exit. The transmission will also recognize when the car is performing a series of overtaking maneuvers requiring rapid throttle position changes. Rather than upshift, it will remain in a lower gear, ready for the next demand for acceleration. The XFR-S comes equipped as standard with the Intelligent Stop/Start system, which automatically shuts down the engine when the car comes to a stop and the brake pedal is held. When the brake is released, the system will restart the engine in less time than it takes for the driver's foot to move to the accelerator. A twin solenoid system, Intelligent Stop/Start allows for 'change of mind' functionality, bringing the engine back up to speed even during its run-down phase if, for instance, the car is coming to a stop at a junction and the driver sees an opportunity to join the traffic flow. "What we have given the XFR-S is greater handling capacity, greater precision and greater capability. It's a car for driving purists - it will feel engaging within the first 50 meters but remains accessible and confidence-inspiring at any speed." Both front and rear suspension systems have been uprated and carefully tuned over tens of thousands of miles at the Jaguar testing center at Germany's renowned Nurburgring track, the high-speed bowl at Nardo in Italy and the engineers' favorite roads around the Welsh countryside. Overall lateral suspension stiffness has been increased by 30 percent front and rear, with front and rear spring rates increased by the same amount. Front suspension knuckles have been revised in line with those found on the XKR-S to achieve the increased camber and castor stiffness which, along with new wheel bearings, optimize steering and handling precision. At the rear, a new sub-frame enabled revisions to suspension geometry which, allied to stiffer bushings, new rear knuckles and working in tandem with the stiffer springs, increase stability and response. In order to achieve the maximum benefit from the suspension revisions, the XFR-S uses new lightweight, forged 20-inch Varuna alloy wheels. These are a half-inch wider at the front and an inch wider at the rear compared to the wheels on the XFR, but are no heavier thanks to their lightweight construction. The tires, developed in conjunction with Pirelli exclusively for the XFR-S, are 265/35R20 and 295/30R20 front/rear. The difference between the wheel rim and tire width increases has the effect of pre-loading the sidewall to improve handling and steering response without adversely affecting refinement. Working in concert with the uprated suspension, wheels and tires are revised electronic programs controlling the Adaptive Dynamics, active electronic differential and Dynamic Stability Control systems. The Jaguar Adaptive Dynamics system uses continuously variable dampers to actively control vertical body movement, roll and pitch rates. The system monitors driver inputs and the road conditions, adjusting damper rates in response up to 500 times a second to optimize stability and agility. The driver's selection of Dynamic Mode offers enhanced body control by moving the damping rates to the firmer end of the available range. The Jaguar active electronically controlled differential can apply full locking torque almost instantaneously when needed. The differential has been recalibrated to maximize the greater grip offered by the wider rear tires, the more precisely controlled suspension and the higher engine output. Working in parallel with the differential, the "Trac DSC" setting of the Dynamic Stability Control system allows the enthusiast driver greater opportunity to explore the handling envelope. The Jaguar High Performance Braking System offers a combination of stopping power, stability and fine modulation commensurate with the car's performance potential. The 380mm (14.96") front and 376mm (14.80") rear discs are internally ventilated for assured repeated stopping power. On the XFR-S, under-body air channeling provides additional cooling capacity. Reflecting the changes under the skin, the XFR-S is distinguished from the XFR by subtle design changes that give it a distinctively assertive appearance while also enhancing aerodynamic performance. "The Design Team was very conscious that it would be the aerodynamic solutions required to deliver the performance of the XFR-S that would dictate its aesthetics. This is a concentrated and focused car and the design revisions and the materials used all reflect that." The new, deeper front bumper incorporates larger lower central and side air intakes â€“ the former framed in carbon fiber â€“ in order to provide adequate airflow into the engine bay. Carbon fiber is also used to form the front splitter at the lower edge of the bumper, the first of a number of aerodynamic changes designed to smooth the passage of the car through the air at high track speeds. The extended side sills and aero blade molding behind the front wheels serve to create a sharp break-off point between the lower bodywork and the road surface in order to keep the airflow attached to the car's sides for as long as possible. The same thinking dictated the deeper side moldings behind the rear wheels. This extended rear bumper also incorporates a central, carbon fiber diffuser, deeper than the item found on the XFR and which travels further under the rear of the car to help reduce lift. Rear lift is also reduced through the fitment of a spoiler to manage the airflow coming off the top rear surface of the car. Two spoiler designs are available, both of which have been designed with the aid of computational fluid dynamics to provide optimally balanced aerodynamics. The larger of the two rear wings is constructed with a carbon fiber aero foil center section. The combined result of the bodywork revisions is a reduction in overall lift of 68 percent. The wider, six-spoke, lightweight Varuna forged alloy wheels provide the XFR-S with a purposeful, broad shouldered stance and feature a unique dual finish. A ceramic polish is applied to the outer surfaces, its eye-catching appearance contrasting with inner gloss black areas. As an option, the wheels can be ordered in either full gloss black or technical gray finish. Gloss black trim in place of chrome around the grille, within the side vent, around the front and rear screens, windows and across the trunk further enhance the car's bold appearance. The mesh in the front grilles is a matching gloss black. XFR-S customers can choose from five exterior colors: French Racing Blue, Ultimate Black, Stratus Gray, Polaris White and Italian Racing Red. The technical palette of interior materials used in the XFR-S underscores the car's high-performance intent. The selection includes carbon leather on the seat bolsters and armrests and a dark mesh aluminum fascia. Providing a further unique touch is the choice of contrasting color stitching and micro piping, which can be matched to the exterior paint scheme. This color palette is complemented inside the XFR-S with Warm Charcoal leather trim on the seats and doors enhanced through the use of carbon-effect leather. Exclusive to the Jaguar R-S cars, this is used on the seat bolsters and arm rests and reflects the use of carbon fiber on the aerodynamic elements of the car. The seats are embossed with the R-S logo and can be finished with a choice of contrast color micro-piping and stitching in either red, blue or ivory. The same subtle enhancement runs across the top of the dashboard, the fascia of which is finished in a Dark Mesh aluminum. The XFR-S is fitted with a standard 825W, 18-speaker surround-sound system from British audio experts Meridian, recognized by audiophiles as a leader in audio reproduction and fidelity. The system uses digital signal processing and the proprietary Meridian Trifield System to place every occupant at the center of an optimally focused surround-sound arena. *These figures are correct at time of going to press. All figures are manufacturer's estimates. Jaguar Cars Limited is a premier manufacturer of luxury sedans and sports cars offering unparalleled design with tremendous performance. The company's vision throughout its storied history has been simple: To produce beautiful, fast cars that are desired the world over. Jaguar strives to provide a world class ownership experience to every owner. Today's Jaguar lineup consists of the XJ luxury sedan, XF sports sedan and the XK coupe and convertible sports cars. Jaguar designs, engineers and manufactures exclusively in the United Kingdom, at the Castle Bromwich manufacturing plant in the British Midlands. Jaguar is fully engaged with sustainability initiatives and social concerns with continuous involvement in environmental and community programs .